We had a blast from the past. Did not enjoy driving on back of big truck to excursion. 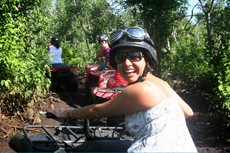 If you&apos;ve never been on a 4-wheeler ATV, this is a great opportunity to do it. Not for the inexperienced on ATV&apos;s.
Not for the inexperienced on ATV&apos;s. This port is horrible. Constant interuptions by people selling things. ATV and Beach. Was a great time. Really great trails, lots of fun.....very well done. Beautiful buses take you to ATV location. Loved loved the ATV experience but didn’t care too much for the beach time. Loved loved the ATV experience but didn’t care too much for the beach time. Beach was over crowded and didn’t like the heckling from the vendors. Loved the single driving ATVs. My husband I took the ATV Jungle and Beach Break tour. The ATV portion of the trip was great. The ATV portion of the trip was great. Wish they spent some time on the ATV’s to let you look around at the sites. The beach afterward was poor. The whole time you had to dodge people selling items and services. Best excursion we have ever done. It was awesome! Very challenging but worth it! Got a tour of Costa Maya on the way to the excursion itself and then ATV-ed through pretty much the jungle. Our guides were very friendly and helpful. Fun, fast and a blast! Fun, fast and a blast! Then they took us to the most beautiful beach ever for some R&R. Would definitely recommend! Drive 35 miles an hour over rocks. Drive 35 miles an hour over rocks. Not much time to see the jungle. It was like a bad roller-coaster ride. These are trails that I would avoid back home and yet I paid for it in Mexico. It was rough, fast, and boring. The ATV was exciting but very wet. The ATV was exciting but very wet. THe beach was only so-so with lots of algue in the water. Costa Maya is not one of my favorite destination. Fun, would do it again. This was difficult--not quite for a beginner but it was fun. This was difficult--not quite for a beginner but it was fun. It is better if you are fit. I am fit and was still sore for a few days after this one.